Madeleine’s video of Nia class UO Student Madeleine Jones visited our Nia class at Willamalane Adult Activity Center in Springfield and made a little video for a class project. Nice job, Madeleine! First, I noticed the pruned branches on the ground. In prior years, I would have demanded that the pruning process include a grandchild as consultant for which limbs could be removed from the “climbing tree” maple while leaving good foot and hand holds intact for the climber. At least, a former tree-climber, like myself, should be consulted if no active climber was available. This year, I thought, well, maybe the grandkids have moved on to bigger challenges to “climb” and the tree has served its purpose. Let the man-with-the-saw create his own art this year. He has an eye for view and design and health of the tree that is a valid blend of science and art to be respected and appreciated. Next, I noticed the bay leaves on the ground. In late winter/early spring they stand out against the new grass growth. The old leaves are pale tan now and only the lace-like veins remain. I remember collecting them one cold day years ago, envisioning the art project they could become. And I remember the hot summer afternoon that all the grandkids gathered with me to paint the lacy leaves and print them onto muslin cloth squares. 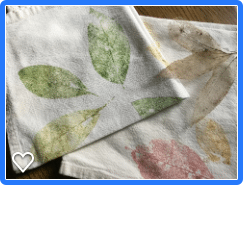 The result was a large collection of beautiful dinner napkins that we still enjoy today – leaf prints in a variety of colors, the beauty of nature displayed in simple, child-made designs. Now, many of us in that long-ago summer arts week still enjoy making things of beauty, and although we could repeat, or add a more sophisticated version of the product, perhaps a newer project with meaning is how we design our lives – clarifying who we are becoming. I notice that I still include myself as a person designing my life. I often say I’m a work in progress. No less than the teens and pre-teens now defining themselves, I am figuring out who I am becoming next. I’m also a guide. Still a summer camp crafts leader of sorts, encouraging others to take the found elements of their lives and create something unique and pleasing to use going forward. I guide younger people, people my own age on either side of retirement, and people decades older than myself, to see what is precious about themselves. I invite students and trainees to examine and sample practices that enhance the pleasure of life – from physical comfort to outlook, to seeing lifestyle as an art form. for this kind of lerning. I’ve always cared about the experience, whether it’s the kid out on a limb searching for the next place to put her foot, or the colleague “out on a limb” seeking to make sense of the crazy events of life. Janet seeks to foster sustainability and resilience in life. Practices from Nia and many other sources help her seek exercise and lifestyle that promote feeling great, allowing her to share insights with others. Every step and every moment is an opportunity to move toward health.